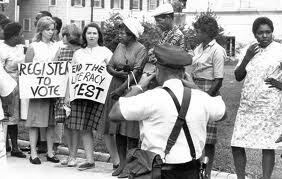 1964 was an important year in the struggle for equal rights. It was the year of the Civil Rights Act and the year in which three civil rights workers, Michael Schwerner, James Chaney, and Andrew Goodman, were murdered in Mississippi by the Ku Klux Klan. The three were there as part of what was called “Freedom Summer.” It was a time in which more than 1,000 young, mostly white, volunteers converged on Mississippi to help register African-American voters who had been disenfranchised by the Jim Crow system and intimidation. Fewer than one in fourteen eligible African-Americans were registered to vote in Mississippi. Among those who participated in Freedom Summer were St. Louisan Chris Hexter, who is now a St. Louis attorney. His mentor in the movement was Charles McLaurin, then a local leader of the Student Non-Violent Coordinating Committee, or SNCC, the organization responsible for Freedom Summer.